Our leisurely Sunday bike ride provided us some further insights on the lengths the Dutch will go to provide an efficient and effective connection for people on bicycles. We decided to travel south through Rotterdam to evaluate some of the treatments in and around the third largest freight port in the world. We turned up some very nice infrastructure without really looking for it. 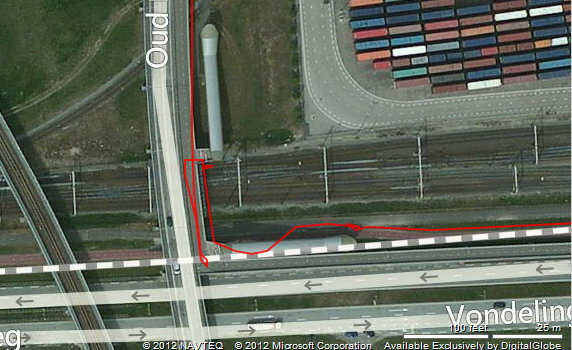 This and the Benelux tunnel post shows what sorts of accommodation is built alongside major highway upgrades. This portion of the ride was the south most part of our effort. This particular facility (shown in the pictures) was built alongside the A4 & A15 freeway to freeway interchange at the intersection of Vondelingenweg and Oud Pernisseweg. The facility provides access to Pernisserpark which is a nice outdoor space next to two very busy freeway facilities in a heavy industrialized area. We were there Sunday and the traffic was constantly buzzing on the freeways with a good amount of noise, so I can imagine it is louder during the week. of the overcrossing of the rail tracks. The overcrossing is in the southern portion of Rotterdam in the area called Hoogvliet and continues into Schiedam to the north. The short back tracking from the north to the south resulted in backtracking to take pictures of the highway A 15 below. 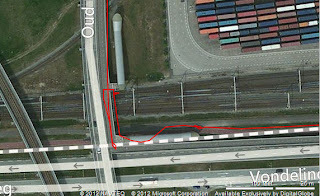 The tracks match closely to our use of the ramp down in the northbound direction. A view from the top of the structure looking back at the separation. Rail on the left and the "elevated right turn" we just made. sand crawler vehicle the Jawas used in Star Wars. This is the entrance to an escalator that allows people on bicycles to make a right turn over several freight railroad tracks. Obviously, it wouldn't be desirable for a cyclist to cross the heavy rail at grade, so this escalator is a facility that gets people up to the grade where they can crossover without any conflict. It uses the old road right of way ( I am assuming) that was vacated after the A4 highway was built. Similar to the Benelux tunnel, one could argue whether this sort of facility (I almost called it an amenity) is necessary. There are many examples of interchange ramps where there isn't special provision for cyclists of this magnitude that work just fine. I will be interested in exploring this with the guest speakers we have and I am hoping there is someone that might discuss the specifics of this type of investment.